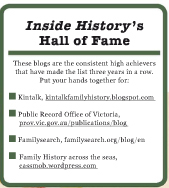 Welcome to August, Australia’s National Family History Month. I don’t know about you, but the days are already skipping away from me. There’s a host of goodies in store for us and these are the things I’m thinking of for my own research. The full NFHM program is here with the chance to win goodies and treats. 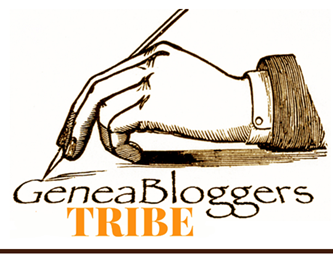 Alex from Family Tree Frog blog is running a NFHM blog challenge aligned to iconic Aussie novels. I’ve got this on my agenda. Alona from Lone Tester blog has a meme for your Ancestral Places. I’ve done quite well and only missing a couple of letters. Don’t forget you don’t have to live in Australia to participate in either Alona’s or Alex’s blog memes. On Tuesday-Wednesday this week I’m off to the Unlock the Past Roadshow in Brisbane and I’m looking forward to getting more tips for my Irish, Scots and German ancestry. I’m also hoping to pick up some clues for my friend’s east German research since that’s something I’m not knowledgeable about. The Roadshow is heading to other cities in Oz and NZ so don’t forget to check if it’s coming to somewhere near you. 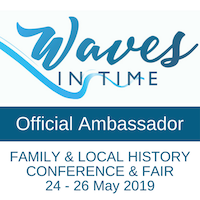 Then it’s off to Toowoomba for a visit to the Catholic Diocesan Archives and to present at the AGM of the Toowoomba & Darling Downs Family History Society on the “Marriage of Local and Family History”. Inevitably there’ll be a side trip to Murphy’s Creek (Kunkel ancestral turf), Crows Nest and Dalby (Gavins) and some graveyard sleuthing even though I’ve been there many times. The Noosaville Library on the Sunshine Coast is running a weekly series of talks with speakers Carmel Galvin, Shauna Hicks, Judy Webster. I wrap up the month with my talk on Writing your family history. If you want to learn more about all matters genealogy, then you could add a subscription to Legacy Family Tree Webinars to your wish-list: an annual subscription is 50% off until 13th August to celebrate their merger with My Heritage. These webinars are excellent learning opportunities and a subscription lets you watch at your convenience plus get presentation notes. In my spare time this month (?!) I’m going to be following more of Twigs of Yore’s DNA graphing. It can look a bit intimidating when you first read each post, but Shelley’s made it super clear and you can readily follow it all if you take your time, step by step. You can see what I’ve done so far on this blog post. Thanks Shelley for the clever technique and inspiration! And in a real-world scenario I was thrilled to meet up yesterday with a second cousin whom I haven’t seen for over 50 years. We had such fun chatting, comparing family stories and heirlooms and I know there’s more fun ahead. What’s on your agenda for NFHM? Will you be doing any of these activities or participating in some other research. Disclosure: I am an Ambassador for the Unlock the Past Roadshow in exchange for free registration in Brisbane.